Learn how to draw a bow using cool effects and simple shapes. This fun illustration doesn't represent a huge challenge in terms of creating shapes and using high technical skills to draw this object. The biggest challenge is to create realistic effects to give life to this image. 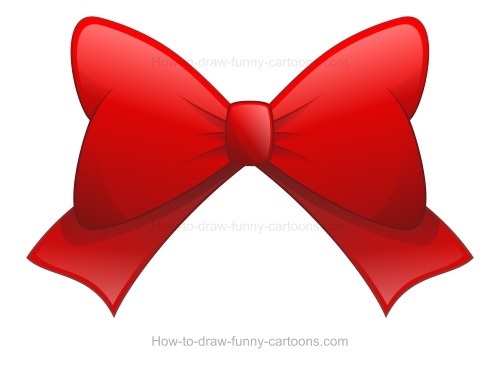 I will show you how to draw this cartoon bow using a vector application so that the result looks visually appealing and convincing. You can see below how the final illustration will look like. Cool! Let's begin the creation of this bow using mostly straight and curved lines. You don't need to duplicate this shape exactly as it is. Don't hesitate to use your imagination to come up with something original and creative. Next, use your application to fill all shapes with plain colors. For this tutorial, I have selected a bright red color. It will be easier to see all effects. Of course, feel free to try something different if you want to. Most modern software are equipped with a gradient fill tool. This powerful tool enables you to add a second color to each shape. In this case, simply add a darker version of the red color used earlier. The goal is to create depth using both a bright and a darker red color. Now that the second color is added on all shapes, draw new shapes on areas that are likely to be further from the light source (which could be located on top of the object). The goal is to create new shadows and add even more volume to the cartoon bow. Below you can see the result once all new shapes are drawn. Ultimately, you could stop this drawing lesson now and the drawing would be perfect. However, I also like to add one more step to make this illustration even more interesting. Draw five more shapes and fill these new shapes in white. Then, use transparency to partially hide the bottom part of these shapes. 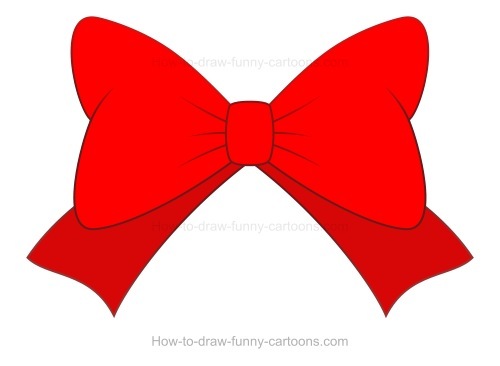 The goal is to create bright areas on the cartoon bow. Logically, these are the places that are closer to the light source. 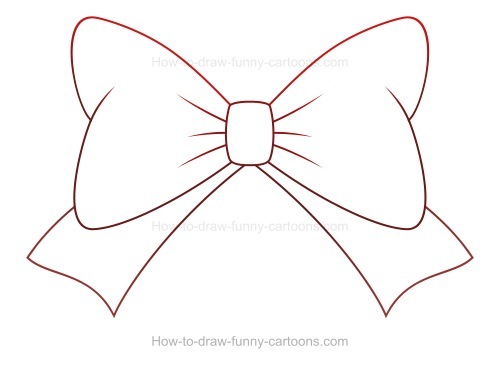 Now you know how to draw a bow that looks realistic!